Fougasse looks like an ear of wheat. In the old days, when people baked in wood fired ovens and had no thermometers to check their temperature, they used "fougasse to assess the temperature of a wood fired oven. 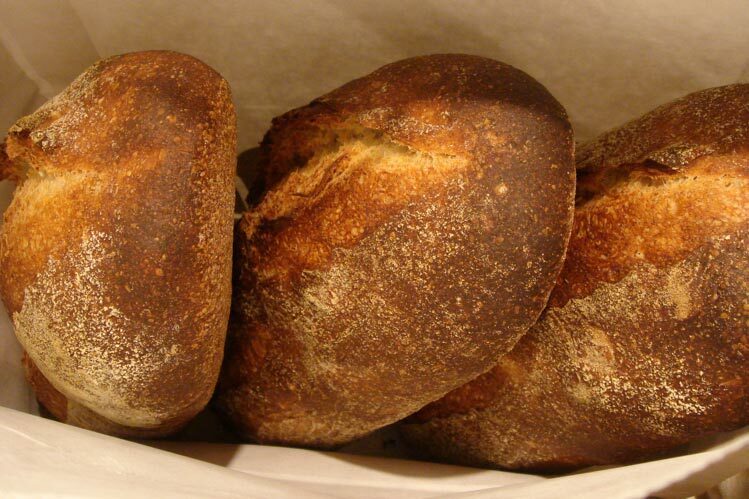 The time it would take to bake, gives an idea of the oven temperature and whether the rest of the bread can be loaded". I think this is a delicious way of checking the temperature. These are the first fougasse I baked, but surely not the last one. This month the Babes are baking fougasse and I’m joining them. Elisabeth of Our Kitchen asked us to bake fougasse. We can use any dough we like, as long as we shape it into a fougasse. I hadn’t baked a Norwich Sourdough for a long time, so I used this dough. I used the extra dough to make a great pizza. There a many flavors you can add to a fougasse. We just found green cardamom pods and I still had some Nigella seeds. And I always have sesame seeds, black and white, in the house. I decided to bake one fougasse with cardamom and Nigella and the other one with roasted black and white sesame seeds. On top I sprinkled some coarse sea salt. I mixed the seeds in the dough and after one hour I placed the containers in the refrigerator for the night. The next morning I shaped them and just before they were proofed enough I sliced them with a bank card into a nice tree shape. In the bowl of a stand mixer, mix the flours, water, and starter on low speed until just combined, about one minute. I used a wooden spoon. Let the dough rest (autolyse) for 30 minutes. Add the salt and mix on low speed until the dough reaches a medium level of gluten development. This took me about 5 minutes. Divide the dough into 2 pieces and add the cardamom/seeds to the dough and mix them quickly trough the dough. Transfer the dough to a lightly oiled containers. Ferment at room temperature (22-25˚C) for 2.5 hours, with folds at 50 and 100 minutes. Or place the containers in the refrigerator after 1 hour, like I did. The next day, place the dough onto a lightly floured counter. Divide it into two 400g pieces. Pre-shape the dough pieces into light balls. Sprinkle the balls lightly with flour, cover loosely with plastic, and let rest for 15 minutes. Shape into fougasse; I gently stretched the dough and used the rolling pin lightly to shape the fougasse. I used a bank card and pressed the card in the dough to get the cuts. Cover and let it proof at room temperature for 2 – 2,5 hours. Meanwhile, preheat the oven, with baking stone, to 250˚C. I placed the cake pan with hot stones on the bottom of the oven for steaming. Place the proofed fougasse shape onto a semolina-sprinkled peel or parchment. I used a bank card to make clean cuttings. Sprinkle with a little olive oil and some sea salt. Once the fougasse is in the oven, turn the heat down to 230˚C. Bake for 5 minutes with steam, and another 10 minutes without steam. I baked this second one without steam. Cool on a wire rack. That evening we had roasted tomato soup with fougasse. I also made some garlic butter. Can you smell it already! Wow!! This is stunningly beautiful. I love that you added cardamom to the dough and then sprinkled with nigella, white and black sesame seeds. Wonderful. Thank you for baking with us! Beautiful loaves Connie! I bet they tasted wonderful. I made the rustic version. Thank you for your kind words. Both of them tasted very good. Croissants with sourdough, what a success!